The moon took quite a beating in its early days, more than previously believed, scientists reported Wednesday.This surprising new view of the moon comes from detailed gravity mapping by twin spacecraft, which slipped into orbit around the celestial body earlier this year. Evidence of a highly fractured lunar interior just below the surface suggests that other rocky planets including Earth would have suffered similar bombardment from space rocks early in their history. Measurements by the NASA spacecraft called Ebb and Flow also found that the moon's crust, or outermost layer, is much thinner than scientists thought  only about 25 miles thick. The findings were presented Wednesday at a meeting of the American Geophysical Union meeting in San Francisco and published online in the journal Science. Though past missions have measured lunar gravity  about one-sixth Earth's pull  Ebb and Flow are the first spacecraft dedicated to this pursuit. To collect data, the washing machine-size spacecraft flew in formation, orbiting about 35 miles above the moon's surface. Their positions allowed them to peer deep into the moon. The spacecraft also managed to see landforms on the moon in greater detail than before including volcanoes, basins and craters. 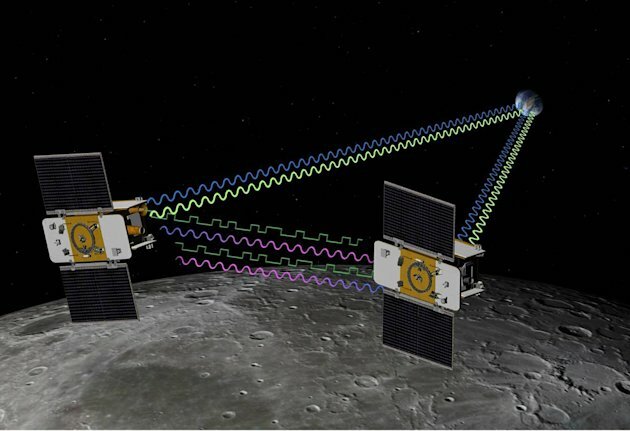 The mission is scheduled to end later this month when Ebb and Flow crash into the moon.